How to Use an iPhone as a Magnifying Glass? Being able to see remote or tiny objects clearly can be important in a wide range of situations. Regardless of the reason why you need to enlarge something, the latest versions of iPhone enable you to perform this task with ease. Triple tapping on the Home button or on the Side button if you have a more recent version of iPhone grants you access to the Magnifier tool that turns the device’s screen into a powerful magnifying glass. In this article, we are going to show you how to use the Magnifier feature on versions of iPhone that support the iOS 11 or later, and we’re going to take you through a few third-party apps that can help you magnify small objects. You may also like: How to Create Magnifying Glass Effects in Video? The newly released FilmoraPro features the magnifying effect which can magnify objects in videos without any quality loss. All you need to do is just drag the magnify effect to the video clip in the timeline and adjust its shapes, radius, bulge, wrap, and blending mode per your need. Now, click the free download button below to have a try by yourself. The Magnifier tool may be disabled by default on your device, and in order to have quick access to it you must toggle it on. You can do this by tapping on the Settings icon and selecting the General option. Find the Accessibility feature in the General menu and tap on it, and once the new menu appears on the screen, tap on the Magnifier option located in the Vision submenu. When the Magnifier window appears on the screen, you just have to toggle the feature on, and if you want, you can enable the Auto Contrast option that automatically adjusts the brightness of the image displayed on the screen to the available ambient light. After you’ve activated the Magnifier, you will be able to access it, along with features such as Assistive Touch, Smart Invert or Color Filters and countless other, by tapping three times on the Home or the Side button. 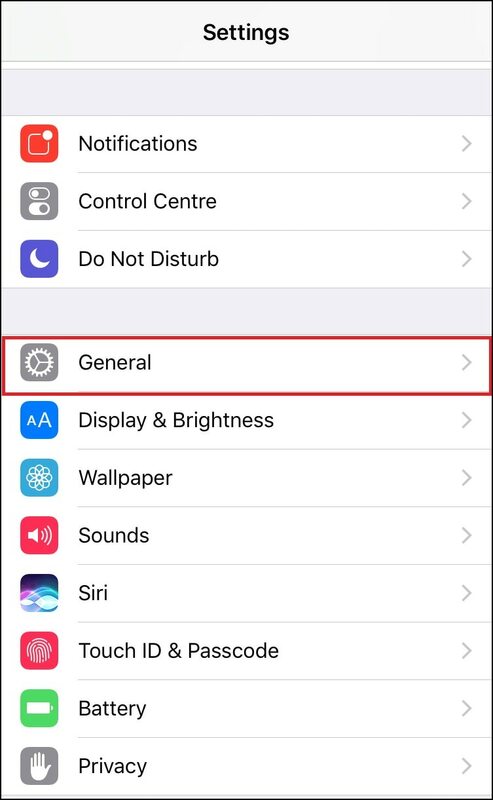 You just have to go to the Accessibility Shortcuts menu, select the Magnifier as one of your Accessibility Shortcuts and every time you triple tap the Home or Side button you’ll be able to launch the Magnifier tool. Besides the stunning magnification capabilities, the Magnifier also offers several other options like Flash, Filters or AE Lock. The Filter setting can be used to control Brightness and Contrast of the magnified image or to apply white/blue, yellow/black or grayscale color effects to the picture preview. If you’re having trouble seeing an object clearly you can switch on the Flash, by tapping on the lightning bolt icon, to throw some light on it. The Focus Lock feature can be quite practical if you’re trying to keep the focus on a single object, while the autofocus option is the best choice if you don’t have the time to pay attention to the focus of the image. Once you adjust all the settings you can take a photo of the magnified object, by tapping on the shutter button. The yellow circle around the shutter button that indicates that the Magnifier is in the Viewing mode will appear after the still image you’ve created appears on the screen. 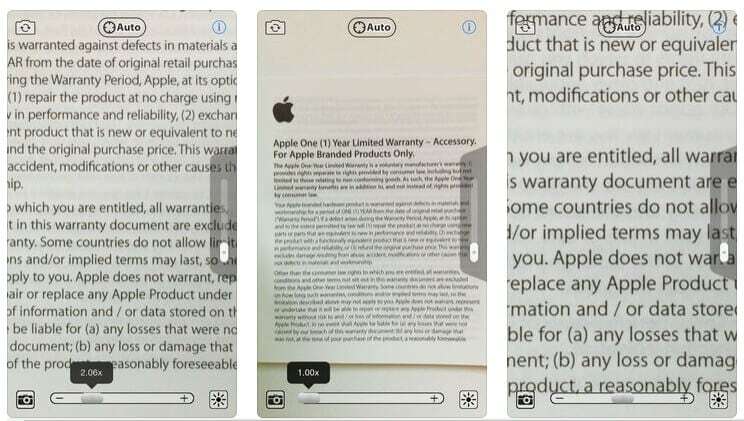 The photos you take with Magnifier will be saved within the app, and clicking on the shutter button will erase the image you’ve taken earlier. That’s why it is better to take screenshots of scenes and objects you magnify since you can open them in other apps and edit them if necessary. Third-party apps that can run on versions of iOS older than iOS 11, often provide powerful magnification tools as well as a variety of options that can help their users to read a dimly lit sign or take a quick snapshot of the enlarged object. 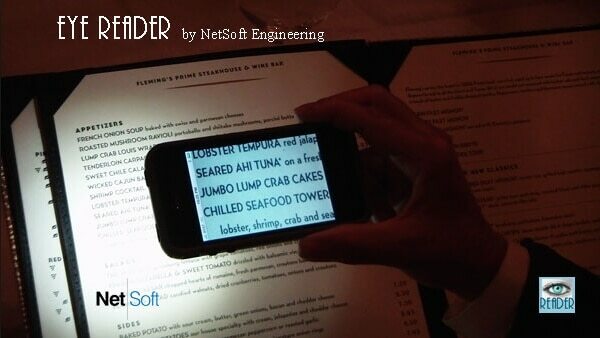 Here are some of the best Magnifier apps for iPhones. 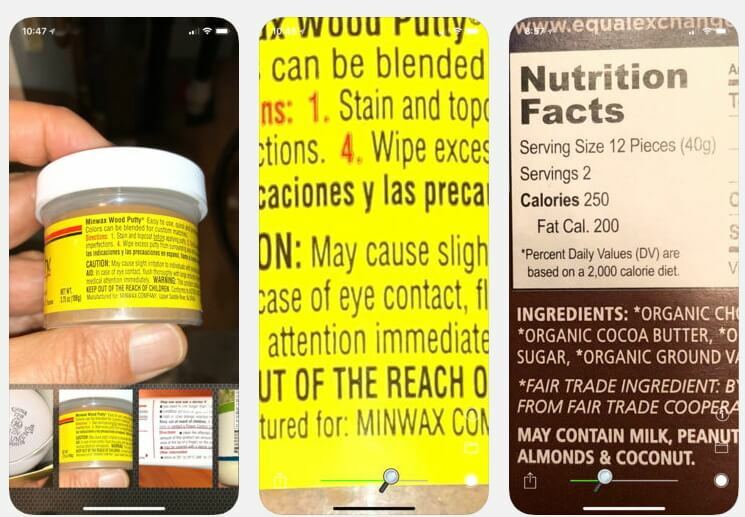 The app lets you magnify objects up to five times the preview’s original size, which gives you plenty of room to zoom on items you can’t see clearly. As its name suggests, the app enables you to add light to a scene and it allows you to control how bright that light is via the Light Level Control Feature. You just have to pinch in order to zoom in or zoom out the picture, while the autofocus lock option enables you to keep the image in focus at all times. The app lets you use both front and back cameras and simply shaking the phone will hide or show the control buttons. The free version of the app offers only a limited amount of options, and if you want to gain access to features such as Image Stabilizer or Crystal Clear and High Contrast modes, you’ll have to upgrade to the pro version of the app. This app can be handy in all situations when you need an extra pair of glasses. Its users can zoom in and out of images either by dragging a slider or by just double-tapping on the image. The Glasses app can save up to eight images and it allows you to save all the pictures you create with the app to the camera roll. You can’t zoom in or out more than 6 times, and in most cases, you won’t need more than that since magnifying the preview image 2 or 3 times is enough to enlarge a menu at a restaurant or any other type of text that is too small to read with the naked eye. Reading small prints in dark rooms can strain your eyes, so instead of wasting time on trying to read something that is barely visible you can use the EyeReader Magnifier app to easily enlarge credit card vouchers, prescription labels or restaurant checks. The latest version of the app can be paired with the Apple Watch which means that you can preview the iPhone’s camera display on your watch. The EyeReader Magnifier uses the LED light to make the reading process more enjoyable. In order to dim or brighten the LED light, you just have to swipe left or right with one finger, and you can gently shake your iPhone if you want to turn the light off. The app enables you to take photos of the objects you magnified and it lets you save them to your device in only a few taps. The Magnifier tool that became available on iPhones with the release of the iOS 11 can be useful in a lot of everyday situations. It can produce a high-quality preview of the enlarged object and it lets you snap pictures of objects you magnify. On the other hand, third-party apps that are compatible with versions of iOS older than iOS 11 are not much less efficient than the Magnifier tool, although you may have to spend some money on unlocking all of their features. Leave a comment below and lets us know what your favorite method of magnifying small objects is. How to Create the Magnifying Glass Effect in Videos?